In the wake of Letang’s five-point night against the Winnipeg Jets, let me get this out of the way: Kris Letang is not a different hockey player this year than he’s been in his career, but his bandwagon welcomes you. If Letang has been held back by anything, it’s injuries and bad luck. He’s had exactly one full season in his career (2010-2011), and the rest of it is an unfortunate mix of commonplace injuries (concussions, 2011, 2012; knee, 2014; “upper body,” 2013), strange injuries (elbow infection, 2013), and even life-threatening conditions (stroke, 2014). In the three seasons after his lone full year, Letang has played just 60% of regular season hockey games. In contrast, Letang has had a pretty healthy 2014-2015 season. Of the 47 games the Penguins have played, Letang has appeared in 41 of them (87%). As a result, he’s third in the league among defensemen in scoring, with 37 points. Might it be his health, and not a coaching change, that’s helped Letang achieve the dominance he’s seen this year? It’s well known that Letang has traditionally been a strong possession player. His 55.8% CF% this year is good for best among all Penguins (minimum 20 games), and he’s made his defensive partners better possession players too. Letang has always been offensively gifted, people will grant. But when did he start being able to play defense? If we consult the “Actual Corsi Against” column of the chart, we can see that shot suppression was something Letang had to work on but that, roughly, he has gotten progressively better at it as his career has gone on. In 2009-2010, his 49.06 Corsi against per 60 (CA60) was good for best on the team, just as his current CA60 of 51.71 also has him above all other Penguins defensemen. For deeper analysis, Expected Corsi against numbers can help put these numbers in context too. As Burtch writes, Expected Corsi is “what you'd expect out of a perfectly average player in an average season if he was handed the same minutes with the same players against the same opposition.” So Expected Corsi can help us account for things like time on ice, quality of teammate, quality of competition, zone starts, and age. Relative to his usage, Kris Letang has exceeded expectations for shot suppression 7 of the 8 years he’s been in the NHL. Offensively, he’s even better: he’s exceeded expectations for shot generation 8 of 8 years in the league. Kris Letang consistently plays above his usage, on both sides of the ice. Johnston's system is good for him, in the sense that Letang plays well in it, but even from a pure scoring perspective, Letang's 0.9 points per 60 this year is just about in line with his career average points per 60 of 1.01. His points per 60 were down last year (0.7), but he had strong years for five seasons before that (2.0, 1.5, 0.9, 1.0, 1.0). Why the sudden appreciation for the strong play--both offensive and defensive--he’s been exhibiting for most of his career? In part, we can chalk this up to having short memories. It doesn’t help that the 2013-2014 season is the most recent season in peoples’ minds, but it's important to remember that, given Letang's history, last season was the exception. Despite a down year, Letang was still generating more shot attempts than expected, but he had a rough year defensively. I believe this can be explained by two factors: (1) health and (2) the Scuderi factor. In 2013-2014, Letang played only 50 games, a period that includes his return from a stroke, in addition to knee, upper body, and elbow injuries (for which he underwent surgery). It's unreasonable to expect any player to be able to play at their best under these conditions, and Letang has spoken about the stress injuries and stroke placed on himself and his family. 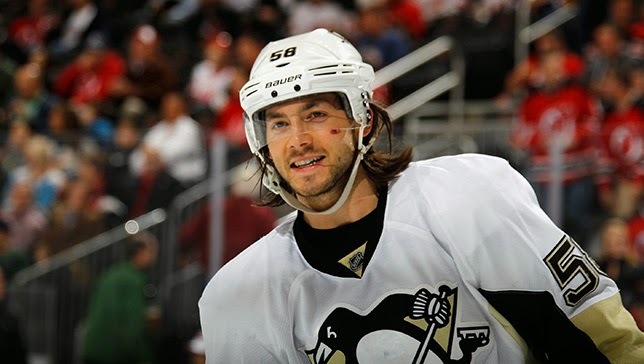 When he was able to take the ice, the minutes Letang did play were often spent chained to Rob Scuderi. Letang’s 48.5% CF% is near a career low (only his rookie year is worse), but he posted a 43.5% CF% with Scuderi and a 50.7% CF% away from him, which is more in line with the positive possession play we have seen from Letang over his career and helps explain why the perception of his play last year was so poor. If we can get past the idea that last year was the norm for Letang, and instead recognize it as a rough period within the larger context of his career, we can appreciate him more fully: an incredibly gifted defensemen that’s been coming into his own for quite some time and one the Penguins are lucky to have locked up. No band-wagoner here. I've said he'll win a Norris at some point in his career since 2010. Good write-up.